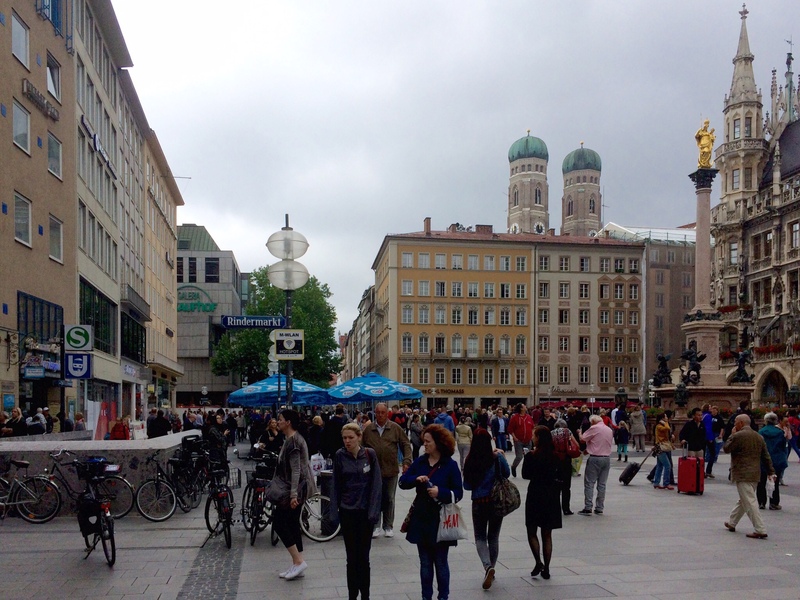 When we arrived in Munich (München) on Sunday afternoon it was in the mid-80s. But, a front moved through southern Germany on Monday and today it was in the 50s. It was odd to be looking for a fan in the apartment one day, then trying to figure out the heating system the next. 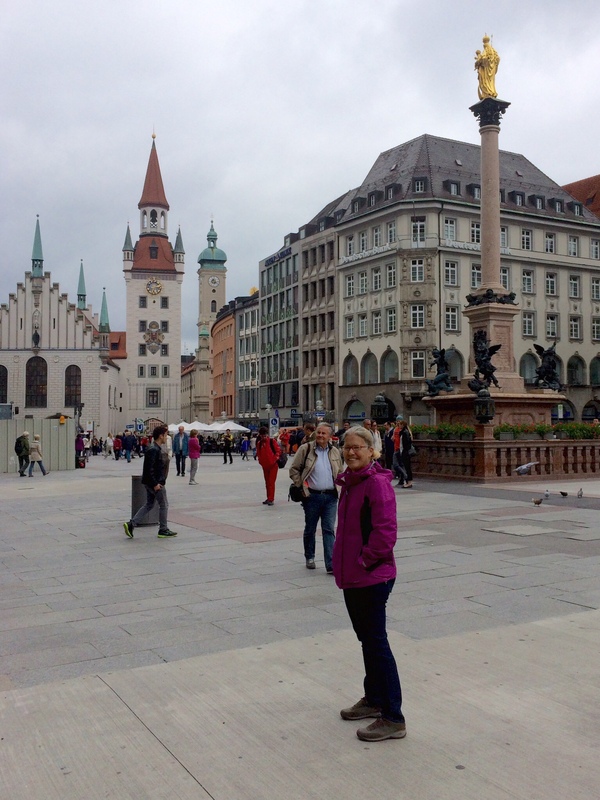 At any rate, we put on our raincoats/windbreakers and took the subway to the Marienplatz, the square in the heart of the old city of Munich. 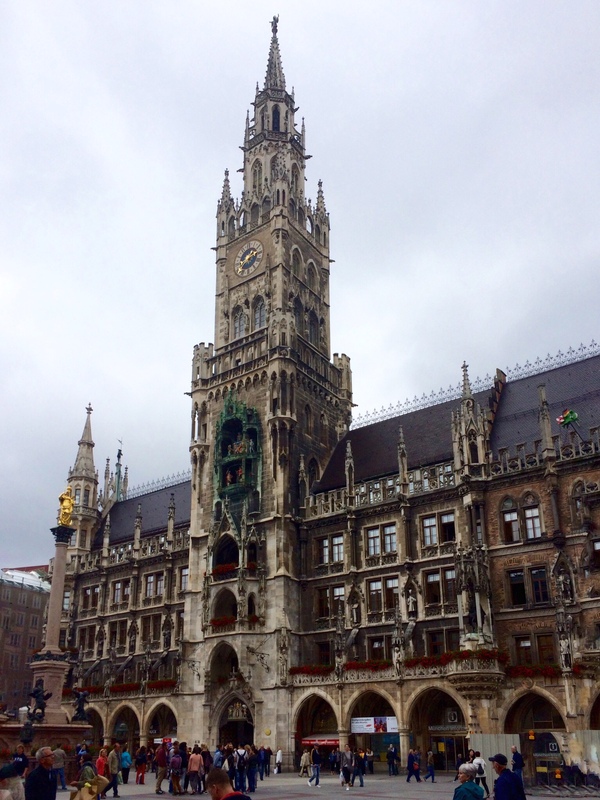 … the Neues Rathaus (New City Hall), to which the city government of Munich moved in 1874. The Rathaus-Glockenspiel is on the City Hall tower (chimes at 11 a.m., noon and 5 p.m.) and I've read the public can go up to a viewing platform near the top of the tower; so, if the weather clears, we'll probably return here later in the week. We were chuckling about the fact that a “Rathaus” in Germany is a City Hall, as we reminisced about the Rathaus at the University of Florida where we had one of our first dates back in 1974. 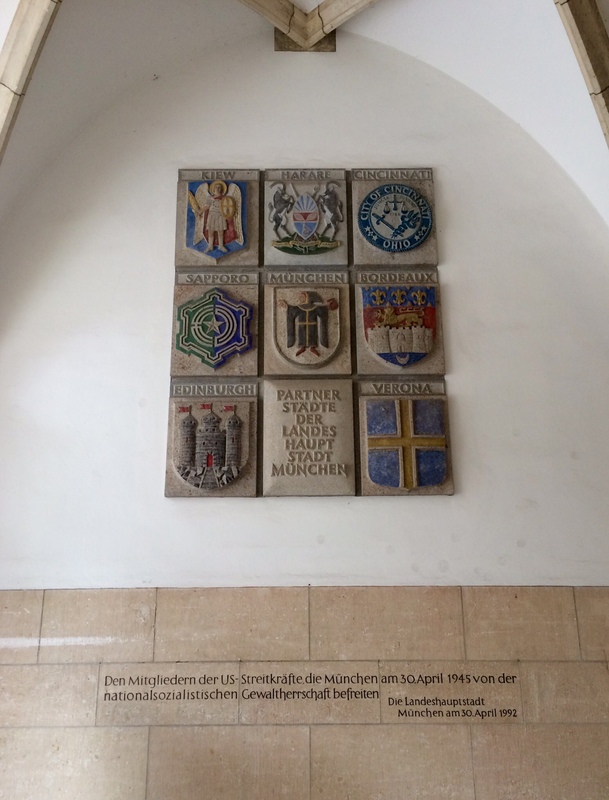 At UF, when we were at school there, the Rathaus was a beer hall in the basement of one of the university buildings. Having been a Bürgermeister myself, I can think of a few City Council meetings that would have benefited from the merger of the two concepts. We went into the courtyard of the Rathaus for a look-see and on the way out, I noticed that the crests and emblems of Munich's sister cities had been posted on one wall, Cincinnati, Ohio, being the one in the U.S.A.
Out front of the Neues Rathaus we could see the city government's old digs across Marianplatz. That white tower with the red top is the Altes Rathaus (Old City Hall), the current version of which was originally built in 1470-1480, although it was severely damaged in WWII and reconstructed in 1971-1974. This is the building from which Joseph Goebbels, Nazi Propaganda Minister and one of Hitler's closest allies, gave a speech in 1938 that led to Kristallnacht and the Nazi pogram against the Jews. Fittingly, the monument behind Dale with the gold statue of the Virgin Mary on top is called a Plague Column. This one is known as the Mariensäule, erected in 1638 to celebrate the city having survived the Swedish Army and the plague during the Thiry Years War in the early 1600s. Well, “celebrate” might be the wrong word, given that the Swedes did occupy Munich in 1632 and the bubonic plague killed 1/3 of the city's population between 1634 and 1635. 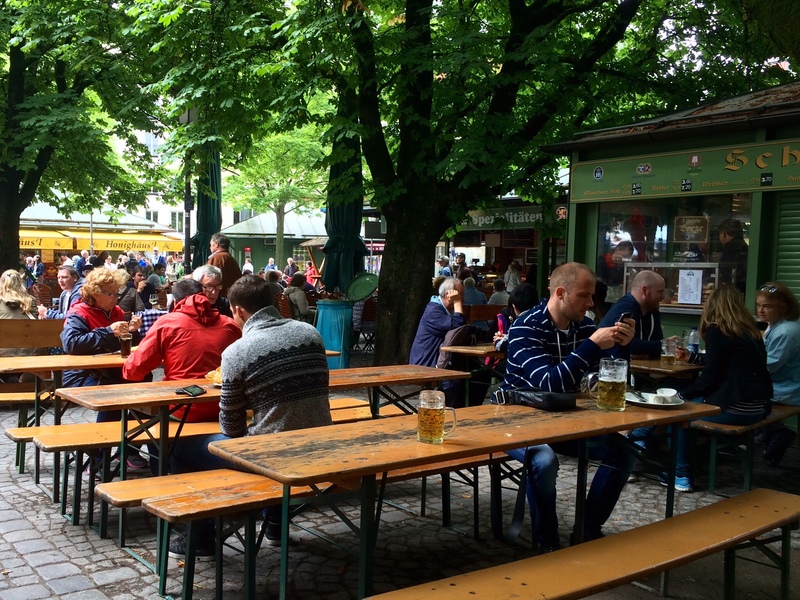 Anyway, we were getting hungry and, after all, we were back in Germany, so off we went in search of a beer garden. … my kind of Rathaus!